PanARMENIAN.Net - Armenian President Armen Sarkissian has appointed Deputy Foreign Minister Garen Nazarian as the country’s new ambassador to the Vatican. Sarkissian’s decree says Nazarian’s candidacy was suggested by acting Prime Minister Nikol Pashinyan. 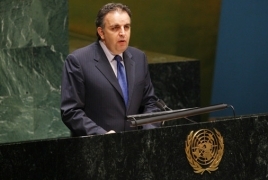 Former ambassador Mikayel Minasyan was recalled from the post several months earlier.